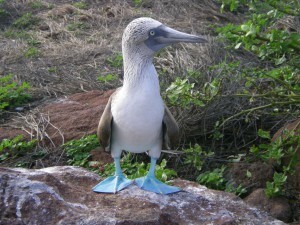 Such bright blue webbed feet you have Mister Booby! More on the Galapagos later, as I’m still readjusting to weather that is neither hot nor humid, while relishing the ability now to inhale air that isn’t full of gnats. Plus there’s the whole accessing the Internet, after being marooned on the median of the information superhighway for a week and a half. Amazingly, the world continued on its path the whole time we were gone, which is a little humbling seeing as how I’m convinced that I am at the center of the universe, there being no countervailing evidence to the contrary, at least that I’m willing to accept. Since the world continued to generate new information and news while I was away, I have to spend some time getting caught up on it. I understand we have a new pope, which is great news for Roman Catholics, as well as people named Francis, who I’m sure have always lamented how underrepresented they were in the papal ranks. Also, of greater potential impact, there’s a Veronica Mars Kickstarter! Great news, everybody!